Cubera (SS-347) was launched 17 June 1945 by Electric Boat Co Groton Conn.; sponsored by Mrs J. Taber; commissioned 19 December 1945 Lieutenant Commander R. W. Paine Jr. in command; and reported to the Atlantic Fleet. After shakedown training off New London Cubera arrived at Key West Fla. 19 March 1946. She tested sonar equipment provided services to experimental antisubmarine warfare development projects in the Florida Straits and joined in fleet exercises until 4 July 1947 when she sailed to Philadelphia Naval Shipyard for extensive modernization. Returning to Key West 9 March 1948 Cubera continued to operate locally out of this port as well as taking part in fleet exercises in the Caribbean and Atlantic until 3 July 1952 when she arrived at Norfolk her new home port. Through 1957 Cubera conducted local operations and participated in fleet exercises in the Caribbean as well as cruising to Sydney Nova Scotia in June 1955. 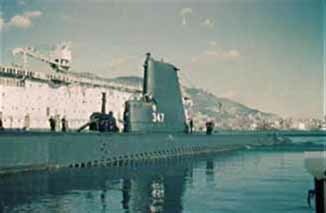 During 1959 and 1960 she was assigned to TF "Alfa " a force conducting constant experiments to improve antisubmarine warfare techniques. With this group she cruised the western Atlantic from Nova Scotia to Bermuda.